Don’t look now, but Tony Stewart is smokin’. 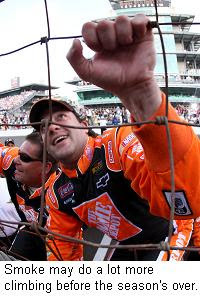 The Home Depot Chevrolet driver copped his second “Allstate 400 at the Brickyard” trophy in three years Sunday, surging past leader Kevin Harvick with less than 15 laps to go, then pulling away to a comfortable, three-second win and his second NASCAR Nextel Cup Series victory in a row. Stewart’s win is bad news for the rest of the Nextel Cup garage, since it signals a return of the momentum that is so much a part of the Stewart/Greg Zipadelli magic. No driver in NASCAR is streakier than Stewart. When things are going badly, he can brood and pout with the best of them. But when things are going well – and they are definitely going well right now – ole’ Smoke can get on a roll faster than any racer alive. In his championship season of 2005, the Hoosier native ripped off a torrid streak of five wins in seven midseason starts – part of 13 consecutive top-eight finishes – that left the competition gasping in his wake. In the last three weeks, Stewart has virtually guaranteed himself a place in the 2007 Chase For The Nextel Cup, and ensured that he will begin the Chase within easy striking distance of the lead. The next few tracks on the Nextel Cup schedule have been good to Stewart in the past, so don’t be surprised to see Smoke riding his current wave of momentum all the way to the beach. Johnson Stuck In Midsummer Swoon: While Stewart surges toward the top of the rankings, defending series champion Jimmie Johnson is heading in the other direction, fast. Sunday’s 39th-place finish at the Brickyard continued a recent run of bad luck that has seen the Lowe’s Chevrolet team plummet from third in points to ninth in the last few weeks. Johnson now stands just 265 points ahead of thirteenth-place Kurt Busch, and while his place in the Chase is not yet in serious jeopardy, things are definitely heading in the wrong direction. Johnson and crewchief Chad Knauss will attempt to turn things around this weekend at Pocono Raceway. Earnhardt Calm In The Face Of The Storm: One might have expected Dale Earnhardt, Jr., to be upset in the aftermath of Sunday’s “Allstate 400 at the Brickyard,” when a late engine failure ruined what appeared to be a sure top-five finish. Instead, Junior was the model of decorum, thanking his team for giving him a good racecar, and taking an “aw shucks” attitude to the mechanical failure that left him just 13 points away from falling out of the Chase. Why the kid gloves? It’s simple, really. As a “lame duck” driver, it will take very little to turn Earnhardt’s relationship with his race team upside-down. Many in the DEI camp remain upset by the criticism he leveled at the team earlier this year when announcing his decision to bolt to the Hendrick Motorsports camp, and any further second-guessing on the part of NASCAR’s most popular driver would be like a dose of salt in those still-open wounds. Earnhardt could have lit-up the DEI engine shop yesterday, or criticized the mid-race “experiment” that left his chassis horribly out-to-lunch for a time, forcing him to battle back from outside the top-10. Instead, he bit his tongue, in the interest of keeping his team intact and unified for the final 16 races of his tenure at DEI. Busch Still Ride Shopping: Both Kyle Busch and his agent have denied published reports that he is set to sign with Dale Earnhardt, Inc. at any moment. Busch says he still hasn’t decided which team he will race for next season, and that it may be two more weeks before he makes a decision. Shrubby is believed to have narrowed his Wish List to three teams; DEI, Joe Gibbs Racing, and Evernham Motorsports. He was scheduled to meet with DEI’s drivers and management Saturday in Indianapolis, and will reportedly do lunch with Ray Evernham later this week. Another driver on the DEI radar is Chip Ganassi Racing's David Stremme. Sources say Stremme is high on DEI's list of potential replacement's for Dale Earnhardt, Jr., if Busch chooses to go elsewhere. 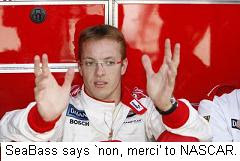 Bourdais To NASCAR? : In the aftermath of his merger with Champ Car’s Newman-Haas-Lanigan Racing earlier this week, Robert Yates said three-time Champ Car king Sebastien Bourdais could end up driving for the new Yates-Newman-Hass-Lanigan Racing Team next season. Carl Haas confirmed that there have been discussions about making Bourdais the latest Open Wheel star to jump to NASCAR, but SeaBass himself said all the NASCAR talk is overblown. Bourdais has previously expressed interest in stock cars, but says his fondest dream is to drive for a competitive Formula One team. He reportedly has an offer on the table from Scuderia Toro Rosso, one of the worst teams in the F1 paddock. Biffle Snit: Greg Biffle may be in line for a NASCAR-sanctioned penalty, after refusing to go to the media center and complete his post-race media obligations at O'Reilly Raceway Park Saturday night. Biffle spoke to network television and to the Motor Racing Network following the race, but refused repeated requests to visit the press box. You may recall that Tony Stewart was fined $10,000 and placed on probation earlier this season for failing to visit the media center after a race at Phoenix International Raceway. Newman-Haas Racing co-owners Paul Newman and Carl Haas will add to their seven Champ Car World Series titles by branching out into NASCAR. Newman-Haas has made an offer to purchase Robert Yates Racing, with an announcement possible as early as Friday at Indianapolis Motor Speedway. Newman-Haas currently leads the standings in search of their fourth consecutive Champ Car World Series crown, with driver Sebastien Bourdais. Co–owner Carl Haas already has a NASCAR connection, owning (along with partner Michael Lanigan) the No. 14 Busch Series Ford driven by Kyle Krisiloff. Haas and also served as a partner in Carter-Haas Racing in 2002, fielding Nextel Cup Fords for Jimmy Spencer and Darrell Waltrip. Robert Yates Racing currently fields a pair of Nextel Cup Fords for drivers David Gilliland and Ricky Rudd, as well as Stephen Leicht’s Busch Series entry. Gilliland is 27th in points, with Rudd 30th and Leicht eighth. Yates has spoken openly about the possibility of a sale for more than a year, after being unable to attract a suitable financial partner for the team. RYR has scheduled a press conference to discuss the future of the team for Friday at 2:40 pm ET at Indianpolis Motor Speedway. Following up on a story that Sirius Speedway first broke yesterday, Dale Earnhardt Inc. has announced that it is acquiring all the assets of Ginn Racing, effective immediately. The move is being called a merger, but in reality, it appears to be a straight buyout of Ginn Racing by DEI. The team will continue to be known as Dale Earnhardt Inc., though Bobby Ginn will be listed as an ownership partner. His will serve as owner of record for the #01 US Army Chevrolet driven by Mark Martin and the #15 Menard’s Chevrolet driven by Paul Menard. DEI owner Teresa Earnhardt will continue as owner for the #8 Budweiser car driven (for now) by Dale Earnhardt, Jr., and the #1 Bass Pro Shop/Tracker Boats Chevy of Martin Truex, Jr. All four cars will compete under the DEI banner in this weekend’s “Allstate 400 at the Brickyard” at Indianapolis Motor Speedway. Menard’s #15 car will assume the owner’s points from the Ginn Racing #14 formerly driven by Sterling Marlin, putting Menard in the Top-35 in owner’s points and guaranteeing him a spot in Sunday’s race. 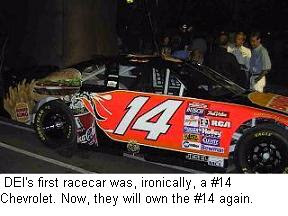 The #14 car is currently ranked 30th in Nextel Cup owner’s points. Rumors persist that a deal is still afoot to sell the owner’s points from the former Joe Nemechek-driven #13 Chevrolet to Furniture Row Racing owner Barney Visser, allowing Kenny Wallace to assume the 34th guaranteed starting spot for Sunday’s race in Indianapolis. After facing repeated roadblocks in her efforts to expand the 100,000-square foot physical plant at DEI, Teresa Earnhardt will move the entire competitive side of the team to the 180,000-square foot Ginn Racing shops in Mooresville, N.C., possibly as soon as next week. The current DEI facility will likely serve as a museum and souvenir outlet for the team. Mark Martin has committed to running another part-time schedule of at least 22 races for DEI in 2008, and will serve as a mentor/coach for DEI’s developmental drivers. A number of details remain to be worked out, most notably Ginn's engine deal with Hendrick Motorsports, which does not expire until the end of the 2008 campaign. Obviously, DEI (which has its own engine development program) will not continue to lease engines from Hendrick, meaning that a final-year buyout will almost certainly need to be negotiated. Martin will use Hendrick Motorsports engines this weekend at the Brickyard, before switching to DEI-Childress power next week at Pocono Raceway. DEI President Max Siegel will continue to serve as second-in-command to Teresa Earnhardt. Ginn CEO Jay Frye will remain with the team through the transitionary period, but is not expected to stay involved beyond the next few weeks. Expect Frye -- who held a minority ownership stake in Ginn Racing -- to become a hot property himself in the coming days, as other Nextel Cup teams vie for his services. What role Ginn himself will play in the new team is still unknown. Just 30 days ago, the wealthy resort and real estate entrepreneur spoke openly of attracting Dale Earnhardt, Jr., to his then three-car team. 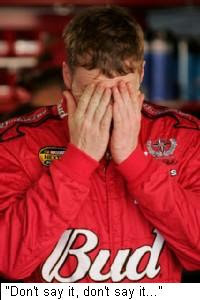 Things went downhill in a hurry, however, with Earnhardt announcing plans to move to Hendrick Motorsports next season, just weeks before Ginn was forced to release both Nemechek and Marlin when sponsorship for his #13 and #14 cars failed to materialize. 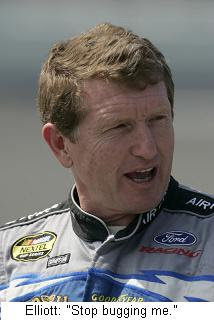 Ginn also closed down his NASCAR Busch Series operation, trimming approximately 30 employees from the payroll. He recently announced plans to add youngster Aric Almirola to his driver lineup for the remainder of the season -- sharing the #01 car with Martin -- while elevating Regan Smith to full-time duty in the #14. Almirola will continue to share time with Martin next season, as planned. Smith's future with the new team is unclear, and he is now scheduled to drive a Ginn Racing Chevrolet in Friday night's NASCAR Craftsman Truck Series race at O'Reilly Raceway Park. A press release announcing the deal today said, "specific schedules for Martin, Smith and Almirola will be announced later." No mention was made of Smith. The status of Ginn developmental drivers Kraig Kinser, Ricky Carmichael and Jesus Hernandez is also unknown. Today's announcement may mark the end of Bobby Ginn's brief tenure as a NASCAR Nextel Cup Series owner. At the very least, it will signal the end of his time as a major decision maker in the Cup garage. He purchased a controlling interest in the former MB2 Motorsports team last year, changed the name and made a number of sweeping changes, adding technology, equipment and funding to what had previously been a middle-of-the-pack team. "When I purchased Ginn Racing last year, it was done with a goal of fielding a multi-car effort capable of winning races and championships," said Ginn. "We came very close to winning the season’s biggest race earlier this year, and today, we feel as if we have done one better by partnering with a company with the legacy of Dale Earnhardt Inc."
Roush Fenway Racing driver Carl Edwards was reportedly injured in accident during a Late Model event at Nebraska's I-80 Speedway Sunday night. Edwards was transported to a local hospital with what sources say appeared to be a broken right thumb after getting caught up in a third lap crash during the 25 lap Super Late Model feature. A car reportedly slowed at the front of the pack, triggering a multi-car pileup that eventually involved 11 of the 28 cars in the race. Edwards walked from his wrecked racer to a waiting ambulance without assistance, and was later transported to Lakeside Hospital in West Omaha for precautionary x-rays. Hospital officials have declined to give specifics of Edward’s injuries, citing privacy concerns. Carl's father, Carl Sr., said his son's hand "looked broken" after apparently getting caught in the steering wheel during the crash. More details as they become available. This week’s moves involving the Joe Gibbs and Ginn Racing teams showcase what is best and worst about big-time professional motorsports. Both teams confirmed today what Sirius Speedway first reported Monday; that JGR has granted Aric Almirola his release, allowing him to compete for Ginn on the NASCAR Nextel Cup Series this season. In addition to sharing the #01 Chevrolet with Martin this season, Almirola will honor the remainder of his contract by running five more NASCAR Busch Series races for JGR. Almirola’s move to Ginn Racing – and JGR’s decision to allow it, despite the presence of a signed contract – is a prime example of decency overriding pure business sense. JGR is in the enviable position of having too many talented young drivers in its stable. With Tony Stewart, Denny Hamlin and JJ Yeley already filling three Nextel Cup seats, and 17-year old superstar-in-the-making Joey Logano tearing up the Busch East Series, Almirola was clearly the odd man out at JGR. 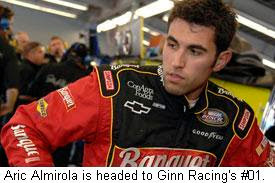 Even if Gibbs elected to expand to four Nextel Cup teams in the near future – something team officials have said they are in no hurry to do – Almirola ranked no better than fifth on the depth charts. By freeing their young protege to accept a Nextel Cup opportunity with Ginn Racing, JGR did what was best for Almirola, if not for themselves. Almirola expressed appreciation for the move, saying, “I can’t thank Joe Gibbs Racing enough for what they’ve done for me. They saw what this opportunity with Ginn Racing meant to me, and they didn’t stand in the way. Joe Gibbs Racing will always have a special place in my heart. While JGR’s decision to grant Almirola his release showcases what is best about the sport, the termination of veterans Sterling Marlin and Joe Nemechek offers a glimpse into the harder side of NASCAR racing. Marlin, 50, confirmed to Sirius Speedway yesterday that he and Nemechek have both been relieved of their driving duties, with Marlin being replaced by 23-year old Regan Smith. Asked if Ginn’s problems can be solved with a simple driver change, Marlin said, “We’ve had a pretty good car at times this year – better than last year – but they’ve had a lot of problems on their side that still need to be addressed. Maybe now, they will. I know I can get up in the morning and look in the mirror knowing that I drove my heart out and done all I could do. For his part, Frye said the team is looking to the future by moving to a younger driver lineup. Both Marlin and Nemechek are among the most popular drivers in the Nextel Cup garage. When word of their firings became public yesterday, internet message boards lit up with comments critical of Ginn Racing. Ginn’s own Fan Forum was shut down late Tuesday, after fans clogged it with scathing criticism of the team. Unfortunately, NASCAR Nextel Cup Series racing is about results, not popularity. One year ago, the #01 U.S. Army Chevrolet (driven by Joe Nemechek) languished in 29th place in Nextel Cup points. Today, the same team ranks ninth in points, with the only significant personnel change being the change in drivers. Nemechek has recorded just one top-10 finish in 19 starts this season -- a fifth in the Daytona 500 – en route to 33rd place in points. Marlin stands 29th in points, with a season-best 13th place finish at Darlington. Neither driver has proven attractive to sponsors, as evidenced by the team’s blank quarterpanels in a number of races this season. As hard-hearted as it may sound, in the big-time world of NASCAR Nextel Cup racing, poor on-track results, plus an inability to attract sponsorship equals unemployment. Whether your name is Nemechek, Marlin or Earnhardt, those are the harsh realities of the business. 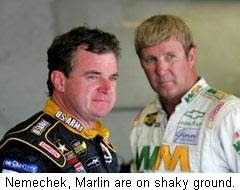 Sterling Marlin and Joe Nemechek aren’t the first to feel the harsh sting of that reality, and they won’t be the last. 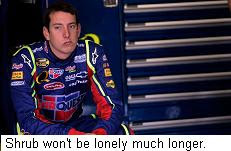 Kyle Busch is keeping mum on his future plans, but it appears his list of potential 2008 employers is now down to four. Richard Childress Racing, Evernham Motorsports, Dale Earnhardt, Inc. and Joe Gibbs Racing. Our sources tell us that it’s probably down to DEI and RCR at this point, with a possibility of Busch running Nextel Cup races for DEI next season, and Busch races for RCR. Team owner Rick Hendrick quashed rumors that Busch will be released from the #5 Chevrolet before the end of this season, pointing out that the team is currently qualified for the Chase For The Nextel Cup, and solidly in championship contention. However, he admitted frustration with Busch’s recent criticism of his Hendrick Motorsports teammates, saying, "It just doesn't make sense to me. We're working as hard as we can." Hendrick’s PR staff is refusing virtually all interview requests for Busch these days, but once he arrives at the racetrack, he is a prime (and apparently willing) target for the media hordes. Contrary to published reports, agent Jeff Dickerson said Busch is not close to signing a deal, and will have nothing to announce at Indy next weekend. Ginn Shakeup Could Come Today: As we first reported yesterday, Aric Almirola will jump from Joe Gibbs Racing to Ginn within the next few days, replacing Regan Smith as part-time driver (along with Mark Martin) of the #01 U.S. Army Chevrolet. 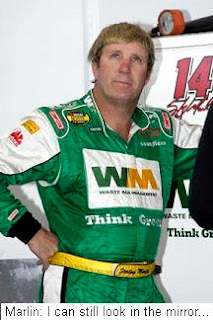 Smith will move to the #14 Chevrolet for the remainder of the season, replacing Sterling Marlin. Both Marlin and Joe Nemechek are expected to be pick-slipped this week (in fact, it may have already happened), as Ginn scales back to a two-car operation for the remainder of the season. CEO Jay Frye has had little luck attracting sponsorship for his two veteran drivers, and when a seemingly airtight deal with Panasonic fell apart at the beginning of the season, the team found itself in a major sponsorship crunch. Both Nemechek and Marlin ran with plain black quarterpanels recently at New Hampshire International Speedway, and the odds of finding additional backing for Nemechek (age 44) and Marlin (50) are not encouraging. Sources say Smith will be moved to the #14 Chevrolet at Indianapolis Motor Speedway in two weeks, while the #13 will be sold to Dale Earnhardt, Inc., which covets the car’s Top-35 standing in owners’ points for driver Paul Menard. Back To The Future For BAM: Beth Ann and Tony Morgenthau hope a dose of nostalgia will be just what the doctor ordered for their struggling NASCAR Nextel Cup Series team. BAM Racing has announced that former crewchief David Hyder will return to the fold this week, reuniting with former driver Kenny Schrader. Schrader has been on the Nextel Cup sidelines since being replaced in the Wood Brothers/JTG Racing Ford by Bill Elliott a few weeks ago. He will reunite with Hyder at BAM, beginning at the Brickyard 400 in two weeks. Hyder – the undeclared scapegoat of the Michael Waltrip Racing “fuelgate” controversy at Daytona – had a quick cup of coffee with Jeremy Mayfield’s Bill Davis Racing team before heading back to BAM this week. "I'm going to build a team from the ground up," said Hyder of his return. "I want to put all the right pieces together." Keselowski Impresses In JR Debut: Young Brad Keselowski boosted his stock another notch Saturday, steering Dale Earnhardt, Jr.’s NAVY Chevrolet to a 14th-place finish at Chicagoland Speedway. Despite battling an ill-handling racer from the drop of the green flag, Keselowski was the top-finishing rookie of the race. He has two more confirmed starts with JR Motorsports; this Saturday at Gateway International Raceway, and at O'Reilly Raceway Park next weekend. Keselowski is the third driver to wheel the JR Motorsports NAVY car in the last two seasons, after Shane Huffman was unceremoniously fired two weeks ago. Huffman was 13th in Busch Series points – fifth among “Busch only” drivers -- leading some to wonder whether expectations in the JR Motorsports camp are unrealistically high at present. Earnhardt himself drove the NAVY car at Daytona, but managed only a 14th place finish after battling chassis issues of his own. Sirius Speedway has learned that Aric Almirola has requested a release from Joe Gibbs Racing, and will move within the next few days to a new position with Ginn Racing, sharing the #01 US Army Chevrolet with veteran Mark Martin. Almirola is currently under contract with JGR, but will replace Regan Smith in the #01 Chevrolet, with Smith moving to full-time Nextel Cup status. Almirola has 53 career starts in the Nextel Cup, Busch and Craftsman Truck Series, and was credited with his first career Busch Series victory in July at the Milwaukee Mile, when he started the race, only to be pulled from the car in favor of eventual winner Denny Hamlin. Ginn Racing has had no official comment on the story, but CEO Jay Frye admitted yesterday that changes are afoot. The team recently laid off a number of employees from its Busch Series operation as part of a “re-evaluation process,” a process that includes "hibernating" the Busch team, possibly for the remainder of the season. He said reports that Ginn will sell the #13 Nextel Cup team are erroneous, but that sponsorship remains a major concern. "We have no intention to shut it down," said Frye of Nemechek's team. "But there comes a point that you have to get it funded. It has to get fixed this year, no doubt. I'd rather be a strong two-car team than a three-car team without a sponsor." Frye hinted that Smith will see more Nextel Cup laps in the second half of the season, a move that does not bode well for Marlin and Nemechek. In fact, sources tell Sirius Speedway that neither driver will be re-signed when their contracts expire at the end of the season, and that one of them may actually receive his walking papers within the next few days. Martin and Almirola will then split time in the #01 Chevrolet for the remainder of the year, with Smith taking over the #13 or #14 Chevrolet full-time. "Hopefully, two or three years from now we'll have three or four 20-something guys in the cars," said Frye. Frye said results of the team’s internal re-evaluation could produce a driver change as soon as next weekend at Indianapolis Motor Speedway, and sources tell Sirius Speedway that Nemechek, Marlin or both could be released as early as Tuesday. Nemechek is currently 33rd in Nextel Cup points with just one Top-10 finish – a ninth in the season-opening Daytona 500 -- and one DNQ. Marlin stands 29th, with a best finish of 13th at Darlington. In a related story, despite widespread reports of a possible merger between Ginn Racing and Dale Earnhardt, Inc., sources close to the situation say a more likely scenario involves the sale of one Ginn team (either the #13 or #14) to DEI, with the two operations remaining independent. Merger talks between the two organizations have been ongoing for some time, but DEI owner Teresa Earnhardt has reportedly been unwilling to pull the tigger and finalize the deal. We knew Jamie McMurray was excited about winning the Pepsi 400, but our friends at FOXSports.com captured a Victory Lane moment we must have missed. Very impressive, J-Mac! Bill Elliott has responded to allegations that he reneged on an agreement to appear in a Super Late Model race at Nova Scotia's Riverside International Speedway next Saturday. "I steadfastly deny that there was ever a final contract, spoken or written, in which I agreed to both attend and compete in the event at the Riverside International Speedway," said Elliott today. "Riverside International Speedway officials contacted my representatives in April 2007 to gauge my interest in competing in this event. Race officials sent a lengthy appearance schedule in conjunction with the event. Although my family and I strongly considered attending the event, on May 15th we communicated to race officials that we were leaning against attending, due in large part to the excessive amount of travel time the commitment would involve. "Speedway and event officials were notified in writing on June 5th, 2007, that I had declined their offer to participate in the event. My family and I are disappointed that speedway and event officials continue to portray us in a negative light as a result of this matter." Speedway officials announced today that Ginn Racing driver Regan Smith will replace Eliott in the July 21st event. Evernham Motorsports owner Ray Evernham says reports that he is close to signing a deal with Budweiser for next season are unfounded. Published reports this week have linked Budweiser with Evernham driver Kasey Kahne for the 2008 season, and while Evernham confirmed that conversations have taken place, he said there is no truth to rumors that he will announce the new deal next week. 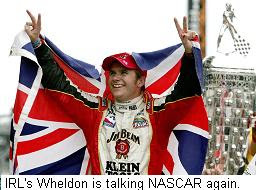 "We have talked to Budweiser, but they have also spoken to five or six other teams in the Nextel Cup garage," he said. "I don't know where people come up with these stories. I understand the desire to get the next big scoop, but to say we're anywhere close to signing a deal with Budweiser is simply not accurate." Red Horse Racing announced today that 1994 NASCAR Busch Series Champion David Green will finish out the year driving the No. 1 RFMS/Red Horse Racing Toyota Tundra in the NASCAR Craftsman Truck Series. Green's first race with Red Horse Racing will be this Saturday's Built Ford Tough 225 presented by the Greater Cincinnati Ford Dealers at Kentucky Speedway. "avid Green will be driving the No. 1 RFMS/Red Horse Racing Toyota for the rest of the year," aid General Manager and Team Owner, Tom DeLoach. "David coached (former driver) Aaron Fike earlier this year, so the team knows him pretty well and it will be an easy transition." Red Horse Racing's decision to bring in a new driver came after Fike's arrest on felony drug possession charges on Saturday. DeLoach said of that arrest, "Aaron has some things to take care of in his life, but Red Horse Racing must continue forward. Having a veteran in our truck will serve us well at this time. David has the maturity and experience that we need right now." Green, a native of Owensboro, Kentucky, has raced in all three of NASCAR's top divisions. The 1994 NASCAR Busch Series Champion has amassed 386 starts, nine wins, 72 top-five, and 144 top-10 finishes in that Series. He has also accumulated 78 NASCAR Nextel Cup Series starts, and has raced in the NASCAR Craftsman Truck Series four times. "I'm really excited to return to the NASCAR Craftsman Truck Series," he said. "I last raced in the Craftsman Truck Series in 1997, and am happy to be returning to the Series driving for a great team like Red Horse Racing. I know that they have good equipment, a great leader in Jamie Jones, a hard-working crew, and one of the best pit crews on pit road." Canadian Track Miffed at "Awesome Bill"
“Awesome Bill” Elliott is apparently not so awesome to the owners of Riverside Speedway in Antigonish, Nova Scotia, after the Dawsonville, Georgia, driver allegedly canceled a scheduled appearance there this weekend. According to the speedway, Elliott had agreed to race in Friday night’s “IWK 250” Super Late Model race there, before abruptly canceling the appearance. Management says they signed an agreement in late April for Elliott to drive a locally owned Super late Model in the event, long before “Awesome Bill” agreed to take the wheel of the Wood Brothers/JTG Racing Nextel Cup Ford, replacing Kenny Schrader. They say they even paid extra for a “no-cancellation guarantee” from the former Nextel Cup Series champion. Apparently, folks in the Canadian Maritimes don’t take disappointment well. Riverside issued a scathing press release this week, saying Elliott, “has proven to us that he is not a man of his word, and his cavalier attitude shows he is nothing more than a prima dona. So much for Elliott's southern gentleman persona. He doesn't think much of his fans in Atlantic Canada. He doesn't think much of track promoters. He doesn't think much of the IWK Sick Children's Hospital. He doesn't think much of his management company. He doesn't think much of the young cancer patient from Port Hawkesbury who wanted to meet his hero. He doesn't think much of making a no-cancellation commitment. I wonder what the present members of the Motorsports Hall of Fame think? Will he let them down? John Chisholm, owner of Riverside Speedway, said, "I'm bewildered and saddened by Bill's change in commitment to his fans, some of whom are traveling great distances to see him here. Bill has always emphasized his enthusiasm for getting back to his roots by racing at local tracks to support the fans who've made him so popular. He's let us all down." The track says it is working to find another big-name driver from the NASCAR ranks to replace Elliott, but has had no luck in doing so. Budweiser To Evernham And Kahne? Budweiser is reportedly negotiating to sponsor an Evernham Motorsports team next season, ending its longstanding relationship with driver Dale Earnhardt Jr.
Budweiser is said to have assembled a list of four drivers it would be interested in sponsoring next season, with Evernham’s Kasey Kahne topping the list. In order for Budweiser to assume major sponsorship of Kahne’s #9 Dodge next season, the Dodge Dealers Group will have to modify their existing deal with the team, which runs through the 2010 campaign. Team owner Ray Evernham told Sirius NASCAR Radio's Sirius Speedway recently that he believes the dealers would be willing to do so. DEI President Max Seigel continues to talk to Budweiser about remaining with that team, but in order to make that deal a reality, DEI would have to sign one of Budweiser’s four targeted drivers to replace Earnhardt next season. Evernham Motorsports officials said yesterday that no agreement has been reached with Budweiser, and that they are talking to several companies about potential sponsorships. However, Budweiser officials have contacted Lowe's Motor Speedway about holding a Press Conference at the speedway next week, possibly to announce their new deal with Evernham. As we first reported nearly three weeks ago, it appears that PepsiCo is the leading candidate to back Earnhardt, Jr., at Hendrick Motorsports next season; through either its Pepsi or Mountain Dew brands, or a combination of the two. NASCAR can no longer look down its nose at other sports on the topic of substance abuse. For years, we have held our sport in high regard, secure in the belief that NASCAR has no major issues with drugs. While Major League Baseball continues to ignore the 2,000-pound steroid-infused gorilla in the room, and NFL and NBA players clog the police blotters with a parade of drug possession and weapons charges, NASCAR has remained comparatively unblemished. 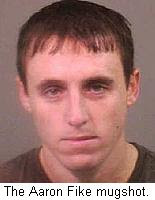 That all changed Saturday night, when NASCAR Craftsman Truck Series driver Aaron Fike was arrested at the Kings Island Amusement Park in Ohio on a pair of felony drug charges. Fike and his fiancee, Cassandra Davidson, were taken into custody after park authorities reported suspicious activity inside their SUV. Police say that when a park security officer approached the vehicle, Fike attempted to drive away, striking the officer with his side mirror. When police arrived, a search of Fike’s SUV revealed heroin, as well as syringes and spoons with residue. The pair is being held without bond at the Warren County Jail in Lebanon, Ohio, and will be arraigned at 9 a.m. ET tomorrow on charges of felony drug possession and misdemeanor possession of drug abuse instruments. NASCAR spokesman Ramsey Poston said the sanctioning body is attempting to determine the facts before responding. “We've seen the media reports, and are reaching out to both the team and authorities,” he said. “We will make a decision once we know a little bit more about the facts." Sources say NASCAR will require Fike to undergo an independent drug test as soon as possible, and will suspend him indefinitely if the results are positive. If NASCAR suspends Fike – and they are almost certain to do so – he will become the fourth upper-echelon NASCAR driver to be suspended for substance abuse-related issues in the last 18 months. Shane Hmiel was suspended indefinitely after failing a trio of NASCAR-mandated drug tests in September 2003, June 2005, and February 2006. Kevin Grubb remains on indefinite suspension after refusing a mandatory drug test in September of 2006, and Tyler Walker was suspended by NASCAR after failing a similar test in May. This time around, it’s heroin, not marijuana. That’s heavy stuff, no matter how you slice it. In addition, we believed it impossible for a driver to use hard drugs and still perform at the top of the sport; trusting that the physical demands of racing at 150 mph precluded anyone from succeeding while chemically impaired. Aaron Fike stood eighth in NASCAR Craftsman Truck Series points at the time of his arrest, with four Top-10 finishes in 12 starts, and a season best fifth-place finish just one week earlier at Memphis Motorsports Park. His strong showing in Memphis -- followed by an arrest on heroin charges just days later -- shatters all remaining pretense that racers cannot possibly be users. For Fike, Saturday night’s arrest almost certainly marks the end of a promising NASCAR career. The prospect of an extended prison sentence looms dark on the horizon, and with four young careers derailed in as many years, NASCAR Nation can no longer sleep soundly at night, secure in the knowledge that our sport is somehow insulated from the issues of the outside world. Some days, the schizophrenia of NASCAR Nation worries me. For months now, I have heard fans say they want NASCAR drivers to be outspoken, opinionated and genuine. They decry what they believe to be an insideous NASCAR plot to turn the inhabitants of the Nextel Cup garage into a group of "Stepford Drivers;" all quoting the politically correct company line, while saying little (or nothing) of real importance. And yet, the minute a driver pops off with anything more than another mind- numbing round of Geoff Bodine sponsor-speak, many of those fans line up to cut his throat. They’ll need two knives this week, courtesy of Tony Stewart and Kyle Busch. 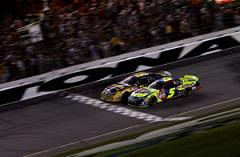 Busch, meanwhile, accused his Hendrick Motorsports teammates of abandonment in the final laps of Saturday night’s race, leaving him with minimal drafting help that played a role in his narrow loss to Jamie McMurray. Busch also said he attempted to congratulate Gordon on pit road after the race, only to be “blown off” by the four-time Nextel Cup champion. Were Stewart and Gordon justified in criticizing their teammates Saturday night? Maybe, maybe not. But either way, they ought to be able to speak their minds. Stewart is developing a propensity for running into the back of other cars, then blaming the run-ee for not getting out of his way. It’s an interesting point of view, and almost certainly flawed to some degree. It is, however, his opinion, and I salute him for expressing it without undue regard for the resulting public outcry. Busch’s remarks were more justified, in my view. When it came down to crunch time at Daytona, his lame-duck Hendrick “teammates” froze him out, just as they froze Brian Vickers out of team meetings when he announced his intention to jump ship at the end of last season. That is their right, of course. Gordon, Johnson and Mears are free to draft with anyone they want, whenever they want. The fact that they cost Rick Hendrick a few thousand dollars in winner’s purse is okay with me, if it’s okay with Rick. No mention of the Shrub. Interesting. Was Kyle Busch right when he accused his teammates of bailing out on him down the stretch? Probably. Was Tony Stewart justified in blaming his teammate for Saturday night’s wreck? Probably not. Right or wrong, though, we should applaud both drivers for speaking their minds. It seems a bit hypocritical to demand outspoken, opinionated drivers, then bash them for their outspoken opinions. I’ll take Smoke and Shrubby over a pair of “Stepford Drivers,” any day of the week. Roush Signs Sponsor: Roush-Fenway Racing President Geoff Smith said yesterday that the team will announce a new, single-season sponsorship for driver Greg Biffle and the #16 Ford within the next 30 days. 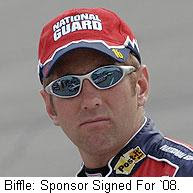 The sponsorship will carry Biffle through the final year of his driving contract with the team. Biffle said recently that he will not sign a contract extension with Roush-Fenway Racing until the performance of his #16 Ford improves. He finished 31st Sunday n New Hampshire -- three laps behind winner Denny Hamlin -- and currently stands 17th in Nextel Cup championship points. Sauter,Busch Fail Post Race Tech: The cars of Johnny Sauter and Kyle Busch failed to meet minimum height requirements during post-race inspection yesterday at NHIS; violations similar to the one that cost Brian Vickers his qualifying attempt Friday. NASCAR has taken both cars back to its Research and Development Center in Concord, NC, for computer scanning, to determine whether the problems resulted from normal raceday wear and tear, or were the result of something done by the teams in an effort to improve handling. Penalties, if any, are expected to be announced late Tuesday. Hendrick Can Buy #8, After All: NASCAR spokesman Ramsey Poston said this weekend that contrary to published reports, there is nothing preventing Hendrick Motorsports from buying the #8 from Dale Earnhardt, Inc. Poston said that while NASCAR technically owns all the numbers, and issues them to teams on an annual basis, DEI could sell the #8 and have the transfer approved by the sanctioning body. Wheldon Questions IRL Growth, Eyes NASCAR: Former Indianapolis 500 champion Dan Wheldon amped up his longrunning flirtation with NASCAR again this weekend, reaffirming his interest in stock cars and questioning the growth postential of the Indy Racing League. “You always want to be making yourself better, and you always want to be involved in a series that's getting bigger and better," said the Brit. "I think everybody knows that I certainly would consider NASCAR. I want to look at the IndyCar Series this year and really consider .. is it going to get a lot bigger than this? Are we going to continue to go to races where we fill the grandstands?" That kind of talk is nothing new for Wheldon, who told Sirius Speedway nearly three years ago that NASCAR was at the top of his eventual career wish list. "We'll Be Back, After This:" TNT has taken considerable heat in recent weeks for its sometimes spotty coverage of NASCAR Nextel Cup racing, and for its seemingly endless number of commercials. In its season debut at Pocono, TNT aired 54 minutes of commercials, consuming 27% of the total broadcast time. The percentage was 30% at Michigan and 27% last week at Infineon Raceway, before skyrocketing to 32.3% Sunday in New Hampshire. Sunday's broadcast ran 192 minutes from sign-on to sign-off, with 62 minutes devoted to commercial content. Sunday's Lenox 300 broadcast featured eight more minutes of commercials than Infineon the previous week, despite a 15-minute shorter total run time. All You Need To Know About NASCAR Sanctions:In an effort to add some clarity to the debate over NASCAR's recent sanctions for violations on the new Car Of Tomorrow, this Technical Bulletin was sent by NASCAR to its teams on March 21, 2007, just after the COT race at Bristol Motor Speedway. It would seem to refute claims by crewchiefs, team owners and others that they were unaware of NASCAR's determination to crack down on COT rule infractions. The bulletin said, in part: “NASCAR may require competitors to submit a car, car component, engine, engine component, or any other parts or related equipment to NASCAR for certification before being permitted for use in competition. Once a car, car component, engine, engine component, or any other parts or related equipment has passed certification by NASCAR, the above must not be altered, modified, repaired or changed in any manner without notification to NASCAR, at which time NASCAR may require re-certification before reusing the above in further competition. Is it just me, or is that the end of the debate?